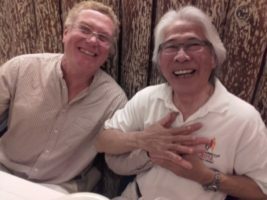 Bocci Aoyama has sadly left us. It is with a sad heart I inform Dragon sailors and friends all over the world, that a great man has joined the angels today, sailing away to different shores. A man full of love for our wonderful sport and dedicated to helping others. 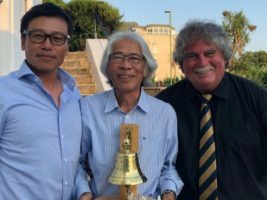 Bocci Aoyama, Commodore of the Enoshima Yacht Club in Japan, host of the 2020 Olympics, lived life to the full. With his loving wife Kimi, they travelled many times to join the European Dragon Circuit. Sailing first his beloved Yevis & then Yevis II (JPN 50) he participated in countless Edinburgh & Gold Cup’s plus many other Dragon events. Bocci always made the days “bigger” where-ever he went, making many life-long friends along the way. Img: Winning the Jordan Bell & 10th Overall gave Bocci so much joy at the 2018 Ed Cup in Img: Torquay. 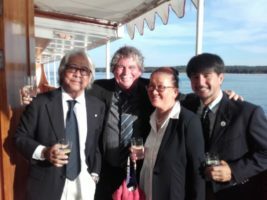 For countless years Bocci encouraged and inspired so many children to take up Optimist Sailing offering all his experience and enthusiasm. 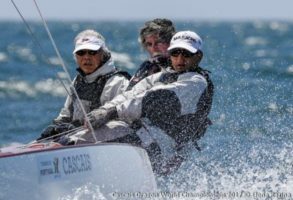 Bocci’s contribution back into the sport and commitment to younger sailors was second to none, quite a remarkable man. Img: Aboard the Danish Royal Yacht, Gold Cup Hornbaek, 2016. With Bocci, Kimi & Nori. 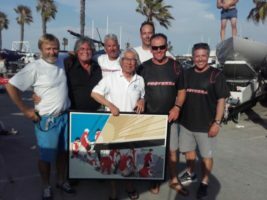 During the 2017 Worlds in Cascais Denis Charvoz presented Bocci with a wonderful “signed” framed photo from Franco Costa, of the Japanese Challenger “Tokyo” of the Louis Vuitton Cup in 1995. Img: Denis Charvoz, Me, Stirfry, Bocci, Kasper Harsberg, Andy Beadsworth & Ron Rosenberg. There is no doubt the world is a lesser place today and our heartfelt thoughts reach out to Kimi, family and close friends. The IDA will be represented by Lowell & Phyllis Chang at the ceremony on Sunday and our prayers are with them all. I leave you with something that I hope brings some peace to such a sad loss. The Ship, by Bishop Brent. I am standing on the seashore, a ship sails in the morning breeze and starts for the ocean. She is an object of beauty and I stand watching her till at last she fades on the horizon and someone at my side says “She is Gone”. She is just as large in the masts, hull and spars as when I last saw her, and just as able to bear her load of living freight to its destination. The diminished size and total loss of sight is in me, not in her, and just at the moment someone by my side says “She is gone”.